The Fallout series first began in the 90s when the first Fallout game was released on the PC. The graphics weren’t much to go by due to the technology available at the time. Fallout 2 was released in 1998 and it wasn’t until 2008 when the next edition to the Fallout series would be seen. Fallout 3 was a hit within the gaming community. Although, many didn’t like the V.A.T.S technique where you could aim at individual body parts and save ammo. Most gamers prefer in first-person-shooter games to be able to shoot at someone without having to aim and to be able to kill an enemy whilst running or without the V.A.T.S. However, in Fallout 3 you have been inside a Vault since you were born and have only ventured out to find your father who has escaped. Therefore, you have no skills with guns or any melee weapon. Furthermore, throughout the game when you level up you get to choose what other skills you can have. For example, you could get the ‘Daddy’s girl/boy’ perk which provides you with +5 science and +5 medicine which means you can now use stimpaks more effectively when you’re hurt. This is why V.A.T.S is included so that you can develop throughout the game and learn to fight. As they say, you don’t run before you can walk. Fallout 3 also had DLC to the game which were Operation: Anchorage, The Pitt, Broken Steel, Point Lookout and Mothership Zeta. This was so that once you finished the game you could continue and explore another island and other areas on the map which you could not previously. Furthermore, the ending of the game before the add-ons was a shock to the system as you think there is more to come but sadly there is not. Well, until you have bought the add-ons to continue playing. Both trailers use contrasting music to set the scene of the aftermath of the atomic bomb. The first trailer shows the actual creatures you will come across during the game. It shows the effects of what has occurred after the atomic bomb and it goes well with the advert you see at the start of the trailer which is foreseeing the future. The Vault which is being advertised is what the character you play has been brought up in. Throughout the game you learn about the character’s father and his life work. During the game you can become a Saviour of the Damned or Demon Spawn. This is due to your karma level which begins as neutral. Depending on what you do throughout the game is how your karma level changes. For example, if you kill innocent people, steal from people or eat human flesh your karma level will drop. However, if you kill your enemy, protect the innocent, do good deeds, go on quests for others without killing them in the process and help the wasteland on its way back to normality, then your karma will rise and eventually you will become a saint of the wasteland. After two years of Fallout 3, the next chapter has finally arrived! Fallout: New Vegas is here and is quite different to Fallout 3. There are new characters, new creatures and you can go into the Casinos and gamble away your money. 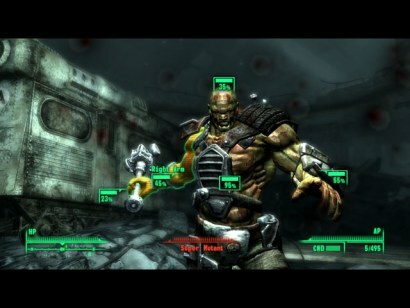 The gameplay is similar to Fallout 3 so if you have played it before, you will be at home with the new game. New Vegas is portrayed like another world in comparison with the Wasteland. It has barely been touched by the atomic bomb. And once I have played the newest edition to the Fallout series, I shall give a review on the game. But I will say what I have heard already. Allegedly there are glitches within the game, as there are in most games, however the glitches begin as the game starts. A lot of people are unsure of what the game is now about and once again there are complaints about the V.A.T.S. But if the gamers don’t like it, they don’t need to play it. As you can tell from the trailer, Fallout: New Vegas is similar to Fallout 3 but with new guns, new creatures and a new environment. Obviously. Hopefully it’s as good as Fallout 3…and hopefully less addictive.